These pickled shrimp make an easy and delicious appetizer. Serve them with spreads and baguette slices, use them to top salads, or serve them as is with toothpicks for guests. 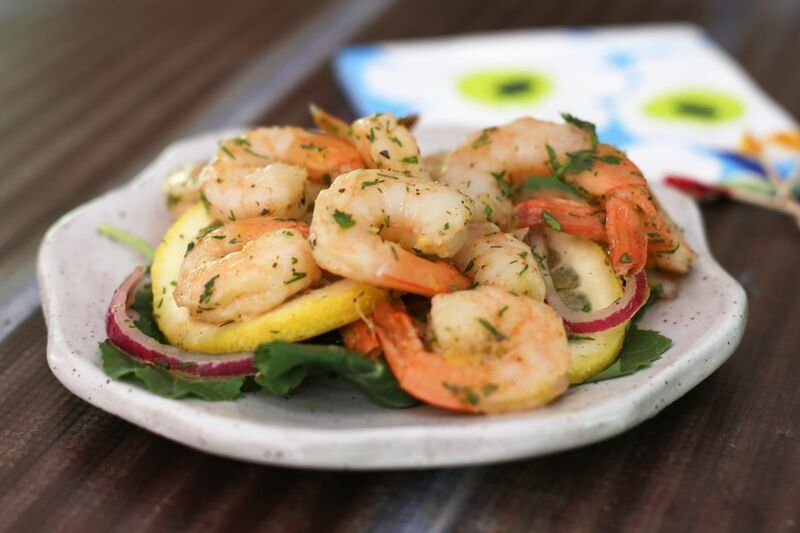 I used chopped fresh dill in the shrimp, but you could omit the dill and use more chopped parsley, or use fresh chopped tarragon, snipped chives, or chopped thyme. Plan to prepare the shrimp and marinade at least 4 hours before serving, or up to 24 hours in advance. If the shrimp are frozen, defrost them in the refrigerator before peeling and cooking. Peel the shrimp, leaving the tail on, if desired. To remove the tail after peeling, tug gently on the end and it should come right off. Remove the vein from the shrimp. With a small, sharp knife, cut a shallow slit down the back of the shrimp. Locate the vein and lift out with your fingers or the tip of the knife. Put the peeled shrimp in a colander and rinse under cold running water. Bring a saucepan filled with salted water to a boil over high heat. Add a little Old Bay seasoning to the water, if you like. Add the shrimp to the boiling water and cook for about 2 to 3 minutes, or just until the shrimp are pink and opaque. Overcooked shrimp will be tough and rubbery, so watch closely. Drain them in a colander and immediately rinse the shrimp under cold water to keep them from cooking more. In a large, heavy-duty food storage bag, combine the remaining ingredients. Add the cooled cooked shrimp. Seal the bag and refrigerate, turning frequently for at least 4 hours (or up to 24 hours). Drain the shrimp and discard the marinade. Put them in a container or bowl; cover and refrigerate until serving time. Use them in pasta or potato salads or add to tossed salads. If serving as an appetizer, arrange the pickled shrimp on a serving plate over greens with cherry tomatoes and olives, and provide guests with toothpicks and napkins.